Pros: This product is ideal for all types of hair meaning that anyone can use unless he or she is allergic to the wax. The DVD included makes this kit very easy to use as anyone capable of reading can use the guide to wax at home. The kit will also save you a lot of money you would have otherwise used in the salon for similar services. Cons: While most users report positive experience with this hair removal kit, some people have complains such as the device overheating or taking too long to heat. Some have also complained that the wax is sticky on them and therefore messy. One of the best ways to get rid of excess hair is through waxing. This is a form of semi-permanent hair removal, which uproots the hair from the root. It will take about six weeks for new hair to grow but the duration may vary depending on other factors. While there are numerous products in the market for this purpose, Rio Total Body Waxing Hair Removal Kit remains among the best for those of you suffering with a little too much unwanted body hair! This kit can be defined as a home wax kit featuring two products that are ideal for the removal of all hair types. The two products include Deluxe Soft Wax that is active on arm and legs and the Salon Hard Wax that is recommended for areas of the body that are more sensitive such as facial hair and bikini lines. The package comes with a convenient and reliable wax heater designed for home use. It also comes with DVD containing all the information regarding the techniques and methods you can use to obtain results similar to waxing done salon. 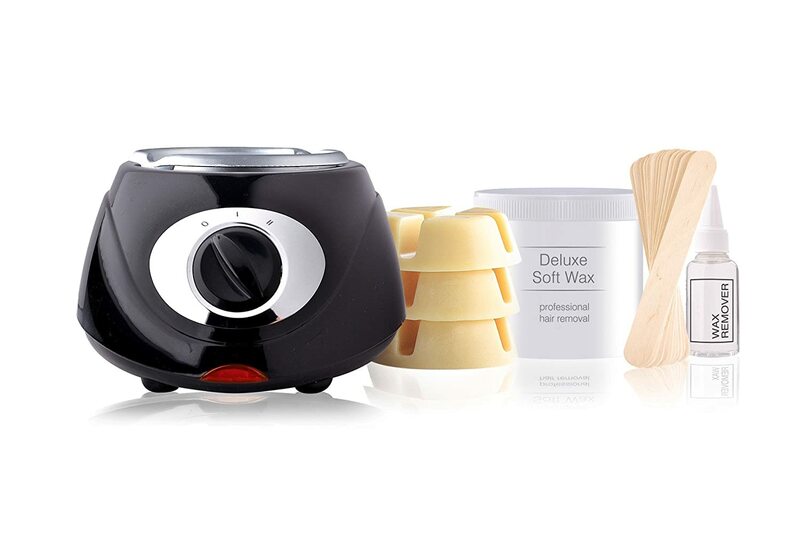 The kit also comes with other accessories including heating pan, paper removal strips, spatulas and wax remover. This kit is super easy to use! All the information on how to use the kit is clearly elaborated in the DVD. Although a bit of a pain I urge you to watch the DVD before you start using the kit, remember, wrongful use of this kit can cause more harm to your skin than good – and that would be a disaster before holiday! With Deluxe Soft Wax, you are supposed to put the tub inside the heater, ensuring the lead is removed. Start the unit so that wax can melt and stir until the wax has a similar consistency to syrup. To use the Hard Wax you place a tablet of hard wax into the heating cup, which you then place in the heater. This should also be stirred until it has thick-honey consistency. You then follow the guidelines set to the letter while applying on different parts of the body.